Ai Weiwei: According to What? examines how the artist spotlights the complexities of a changing world and probes such issues as freedom of expression, individual and human rights, the power of digital communication and the range of creative practice that characterizes contemporary art today both in China and globally. When I visited the exhibition one weekday afternoon recently, the, the space was busy, and visitors seemed to be absorbed — looking carefully at the art, pausing to watch videos, listen to audio, and leave a comment at the feedback booth. Media coverage has been extensive and almost all of it positive. How can a contemporary artist from China catch the attention of a wide audience in Canada? Part of the draw of the Ai Weiwei exhibition stems from some simple principles. Canadians may have heard of Ai Weiwei before the AGO show opened. Ai Weiwei’s exhibition of thousands of ceramic sunflower seeds at Tate Modern was a sensation, talked about worldwide. The artist helped to create the Birds Nest Stadium at the Olympics. And, most notoriously, Ai Weiwei was arrested and his passport revoked by the authorities in China after he started to document and speak out against poor construction standards following the 2008 earthquake in Sichuan. And so, even before the show opened, the artist’s name was known, his activism admired, and some of his artwork familiar. The artist’s reputation as an activist may have drawn some visitors to the AGO through the doors, but, of course, it is the compelling quality of his work that makes an impact. Ai Weiwei’s art fascinates in many ways. 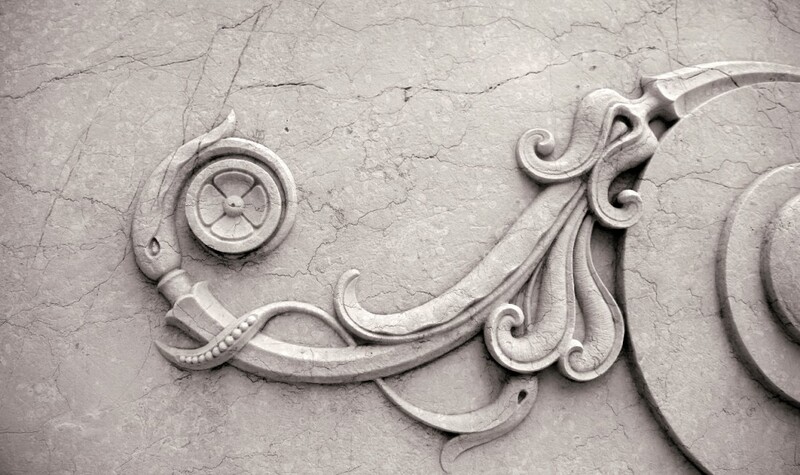 There is the superb craftsmanship; many techniques and materials are literally ancient. The openness of Ai Weiwei’s methods of working are so intriguing — he often conceives of an idea, but leaves it to many others to implement. His materials are simple: backpacks, bicycles, chairs, blocks of tea. And yet , Ai Weiwei’s work captives and demands attention. He wants us to think about human rights. 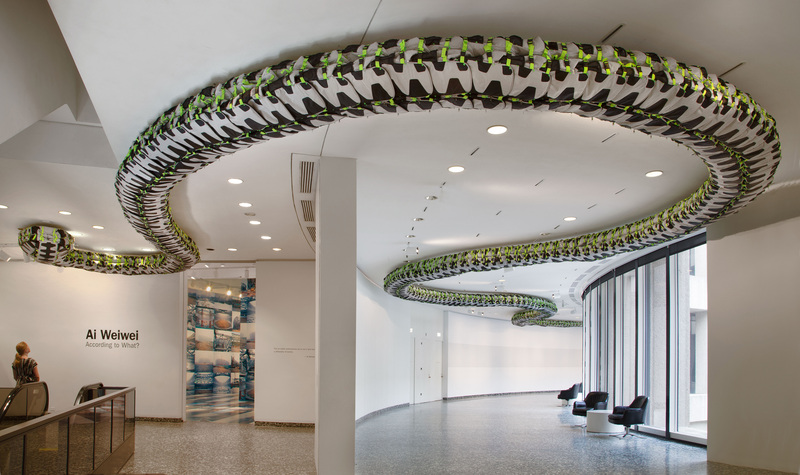 He wants us to look at the snake-like ceiling-mounted installation of children’s backpacks and think about each child who died in the Sichuan earthquake. 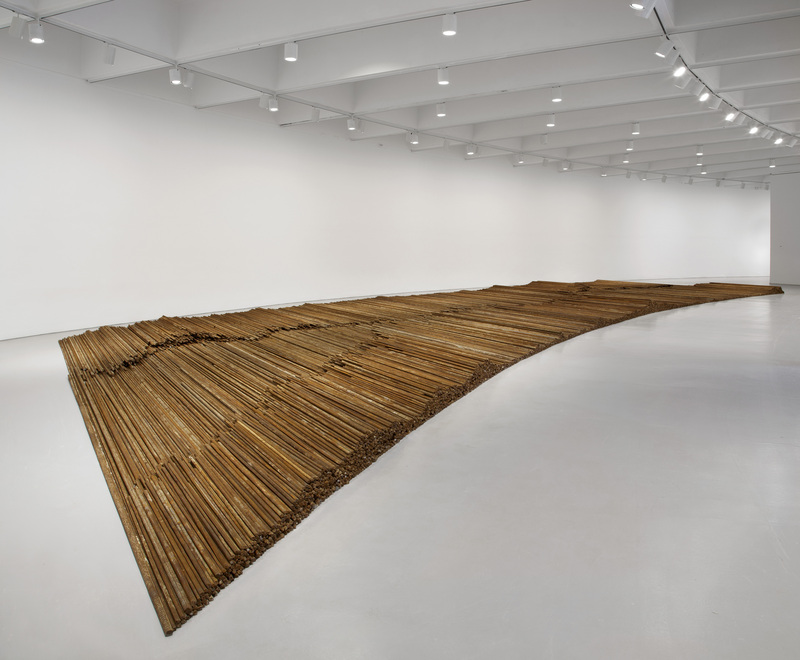 He shows us how a tangled mass of stee rebar found in the rubble of collapsed schools was straightened out then laid out in neat rows on the gallery floor. He speaks from a position of authenticity — his life experience forms the basis of his authority. Is the art in Ai Weiwei: According to What accessible to a visitor who is not an expert in contemporary art? Yes. Is that art relevant to our lives today? Yes. Does it transcend those categories and make you want to look carefully and think about what the artist is saying about our lives today? Yes. That is why the AGO has chosen wisely and is presenting an exhibition that there is every reason to visit. Ai Weiwei: According to What? continues at the AGO until October 27th and then moves on to the Perez Art Museum in Miami (November 18, 2013 to March 16, 2014) and the Brooklyn Museum, Brooklyn (April 18 to August 10, 2014). and Sculpture Garden, Washington D.C., 2012. Categories: museum exhibits | Tags: Ai Weiwei, Art Gallery of Ontario, exhibit review | Permalink. After reading this post, I will be sure to catch this exhibit. Very interesting.